KeepCup is the world's first barista standard reusable cup, designed for coffee lovers on the move. KeepCup is a practical commuter cup replicating the core form and functions of disposable cups, but adding reusability, recyclability and the opportunity to add your own individual flair. 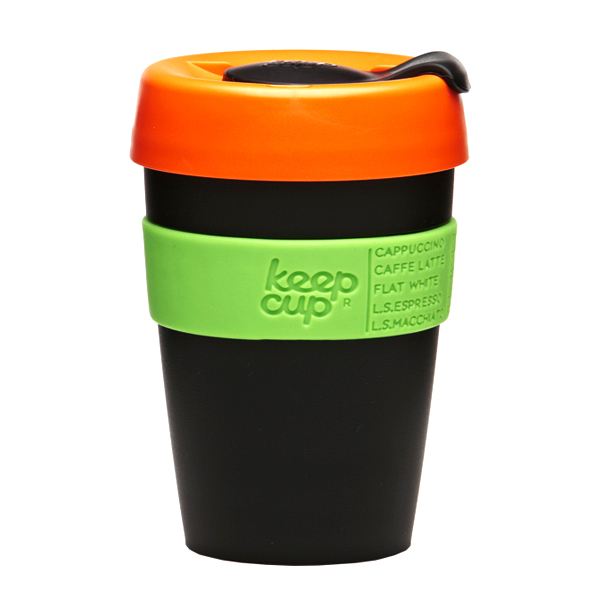 Over 800,000 environmentally conscious commuters in Australia have now adopted the KeepCup. If we estimate that 80% of these users drink 8 takeaway coffees per week, then over a year, KeepCup users will have diverted 300,000 million disposable cups from landfill. This equates to removing over 4000 tonnes of disposable cups from the waste stream and saving enough energy to power 5000 homes for a year. Furthermore, this leaves 50,000 trees left standing in a forest somewhere - that's a lovely thought. 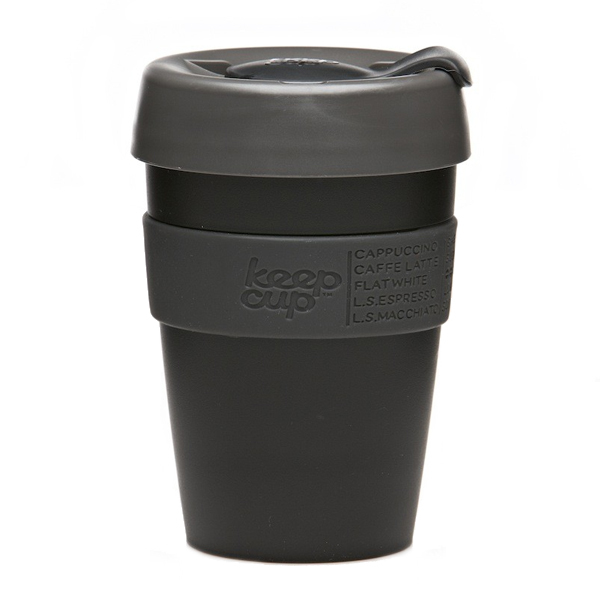 The KeepCup has been commended for its considered design and sustainable credentials. KeepCup was a finalist in the City of London's Sustainable City Awards (2010), Premier's Design Awards (2010) and Melbourne Day Awards (2010), as well as being shortlisted for the Australian International Design Awards (2010), the Red Dot Industrial Design Awards Hamburg (2010), and winners of the ECO-Buy Green Supplier of the Year 2011. To ensure easy recycling, the KeepCup is designed as a four part product, manufactured from single component materials: polypropylene for the cup; high-density polyethylene for the lid; silicone for the thermal band; and thermoplastic polyurethane for the plug. It is also certified BPA-free, and is free of phthalates, PVC and excluded other toxins to make a clean and healthy cups. Fits in car cup holders and bike holders. You can etch your personal coffee preferences on the insulating band. Cup made with Polypropylene (PP) (recyclable and has the number "5" as its resin identification code), Lid made with high-density Polyethylene terephthalate (PET) (recyclable and has the number "1" as its resin identification code), Thermal band made with Silicone (safe temperature range: -20°C to 140°C (-4°F to 284°F)) and Box is made from 95% recycled card and printed with vegetable ink. An eco-friendly alternative to single-use paper and plastic cups. Eliminate hundreds of disposable beverage cups over the course of one year _ thousands over the course of a lifetime. Using Keepcup instead of disposable plastic cups at restaurants will help save hundreds of cups and from landfills. Single-use, disposable water bottles create millions of tons of unnecessary waste each year. In fact, they are less than 15% of plastic water bottles in the world are actually recycled _ most wind up in landfills where they can take up to 1000 years to biodegrade. Remove lid before microwaving. Do not microwave empty. Carry and use in place of cheap disposable plastic cups provided at restaurants. These are a great gift for anyone you know who's hesitant about giving up their disposables! KeepCup was founded in 2007 by Abigail Forsyth and her brother Jamie Forsyth. Prior to KeepCup, they operated a food take-out business with six stores in Melbourne, Australia, selling fresh sandwiches, salad and coffee -- to go. However, they became increasingly concerned about the waste associated with their business and began to think that convenience was coming at too high an environmental cost. In their business, the "to-go" cup was the most conspicuous and voluminous piece of disposable packaging and they went about trying to find alternatives. At first, they tried to find a suitable commuter mug -- but they were bulky, ugly, didn't fit under the espresso machines and came in irregular sizes. So they set about creating new ones. In June 2009 the first KeepCups were manufactured. Since then, Abigail and Jamie estimate that through sales of their cups, they have diverted 30,000 tonnes of disposable cup-waste from landfills.